As you start to wind down for the night, it's important to remember that everything around you needs to be clean and calm before you can drift off to sleep. This all starts with your nightstand. You should treat your nightstand the way you treat your desk. If you're space is organized so will you be. A nightstand is no exception. You should keep it clean and organized and declutter as much as possible. Here are the top ten nightstand essentails you need for a good nights sleep. Hair Ties // This one is so important because the worst situation is when you need a hair tie, but you're really comfy in bed. I keep a couple right in my drawer for an easy reach. Melatonin // If you struggle at falling asleep as quickly as you'd like, keep some melintonin by your bed side. I personally like the Olly Sleep Gummies! Room Spray // Bath & Body Works has the best smelling room sprays, but I think Target would be a close second. Right before bed I always spray something that smells good to put me in a relaxing mood. They also have lavender smelling ones to help you sleep. 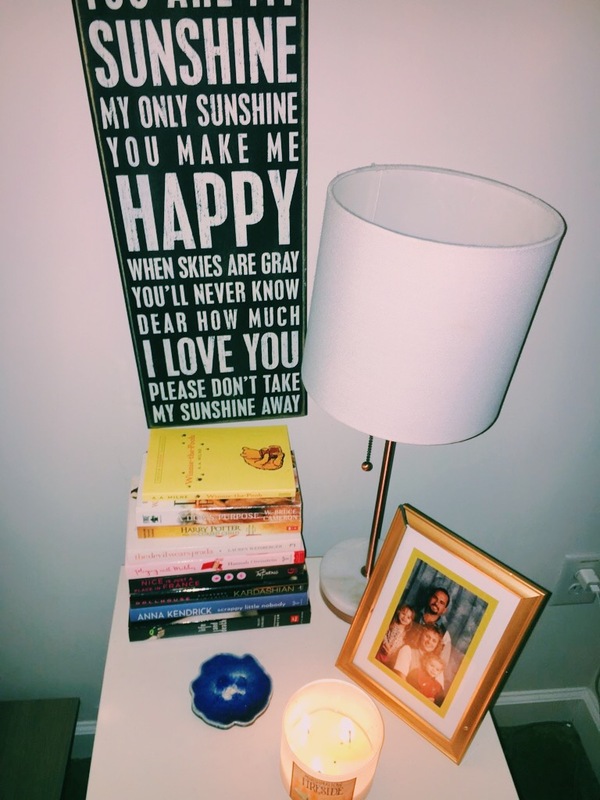 Candles // Candles are important for every room, but especially your nightstand. Not only does it smell good, it's sort of relaxing to have a candle lit as you're curled up into bed. Lamp // This one may seem obvious, but not everyone has a lamp on their nightstand. This is a great way to not disturb your partner in the middle of the night by turning on the main light for the bedroom. Chapstick // This goes hand in hand with the hair ties, but you never know when you're going to get an attack from dry lips. Be prepared and keep one on hand. I personally love the Laneige Lip Mask, especially for bedtime. Lotion // With my lips getting dry, sometimes my hands get really dry too. I don't want to go to the bathroom to get a whole thing of lotion, so I keep a small hand lotion in my nightstand drawer. Sleep Mask // If you're sensitive to light, then you need one of these. Our sleep masks come in handy when one of us falls asleep before the other one does, that television light can be kind of annoying. Charging Station // Your electronics are going to be near you when you're getting ready for bed. It's inevitable nowadays, especially since our phones are our alarm clocks. Have a charging station next to you for an easy grab in the morning. Books // After you're all plugged in for the night, try to detatch from the screens and read a book. Although, if you're really into a book try to limit yourslef to just a chapter (or two). What are some of your nightstand essentials?